The fine folks at Truecaller have just announced their application has just been updated with a couple of new features, some by popular demand. 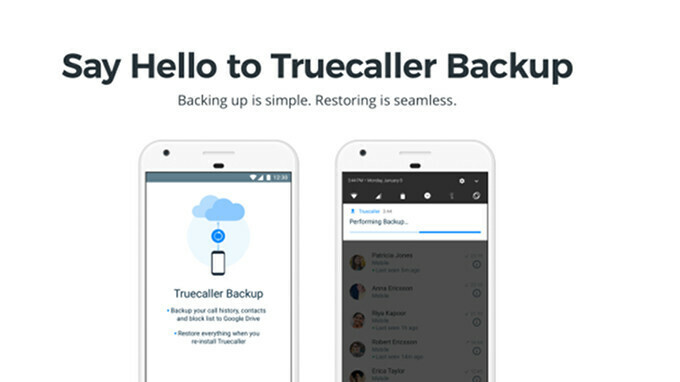 As the title says, Truecaller now features a backup option, which will allow you to backup all your contacts, call history, call logs, block list, and settings preferences. According to developers, the backup is stored on your Google Drive for safe-keeping, so if you don't have an account you're be prompted to create one the first time you backup Truecaller. The backup option has a setting that enables you to select how often you want the app to backup your data. Another important new feature, Contacts is now available to all Truecaller users. Basically, this will allow you to view a list of all the contacts you've ever had from any Call, SMS or transaction. The best part is that even if you don't save a contact, you'll still be able to find the person you've interacted with in the past. Both new features come via the latest update, so if don't forget to download the latest Truecaller version to benefit from the new Backup and Contacts options. The app is fine, but I always uninstall it after a few days because it is such a RAM hog and it swallows mobile data like a bottomless pit. Functionality is great, but very poorly optimized. Exactly this ^. The features do not justify the resource drains, to me.